SULU, Philippines (Mindanao Examiner / Feb. 23, 2011) – Sulu province in the southern Philippines convened Wednesday a meeting of various government agencies and stakeholders to draw plans that would effectively address natural calamities and other emergencies. 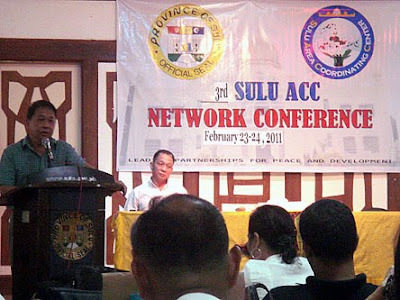 Governor Sakur Tan has called on stakeholders to actively participate in governance and to strengthen and revitalize the networking capabilities of the Sulu Area Coordinating Council, which coordinate the province’s various nongovernmental agencies, military, police, emergency services and other organizations and serves as an inter-agency communication network. Tan is the chairman of the Area Coordinating Council which he established as a proactive, reactive, and post conflict mechanism to address various concerns at regional and local levels of governance and to solve problems of coordination and response. “My official position is merely temporal, but the community and the people will outlive any political position or personality,” he added. Eight people had been killed in Sulu’s coastal town of Jolo after flash flood swept away houses and destroyed government infrastructure. President Benigno Aquino visited Sulu on February 11 and met Tan and other government officials and he led the distribution of relief goods to thousands of villagers left homeless by the floods. Tan said despite the calamity, many good things are happening for Sulu and he cited Aquino’s visit to the province. The president pledged more development projects for Sulu, one of five provinces under the Autonomous Region in Muslim Mindanao. He said a day after Aquino’s visit, Social Welfare Secretary Dinky Soliman flew to Sulu for the second time in 24 hours to hand-over shelter projects and launched government-financial assistance program for the poor. These were on top of hundreds of housing projects built by the provincial government recently. Tan said Sulu will host the regional police headquarters that will oversee peace and order in the province and nearby Basilan and Tawi-Tawi provinces which are also part of the Muslim autonomous region. The regional police headquarters are currently located in Maguindanao province in Mindanao. “Peace and order is an integral component of development efforts and the regional office in Sulu will mean more effective and quick responses to eventualities,” he said. On Thursday, Agriculture Secretary Proceso Alcala will fly to Sulu from Manila to lead the groundbreaking ceremony of the P32-million fish port and cold storage facility in the town of Maibung. He said if completed, the facility will be handed over to cooperatives whose members are mostly fishermen. The Area Coordinating Council has been recently chosen as one of the finalists for the prestigious Galing Pook Awards. Fazlur-Rahman Abdulla, Executive Director of the Area Coordinating Council, said the facility also functions both as a system and as a council for planning, integrating, directing, supervising, and implementing line-up government programs and projects particularly on political, socioeconomic, cultural, religious, development, security and information issues.